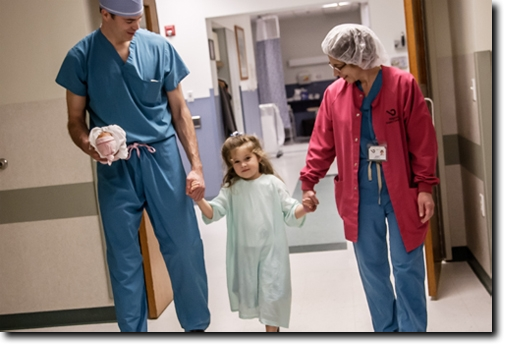 Welcome to Brighton Surgery Center, a facility designed and built to provide patients, physicians, and surgeons the latest capabilities and amenities in outpatient surgical and procedural care. This page will provide you with information you need to make your outpatient surgery/procedure go smoothly. Please visit the FAQs page for answers to common questions about your visit to Brighton Surgery Center. A friend or family member must remain at the center with the patient and drive the patient home. As you wait during the surgery or procedure, you'll enjoy a waiting room that features comfortable chairs, two TV sets, and wireless Internet. We value your feedback. Please complete a questionnaire about your experience. Your comments will let us know what we are doing right and what we need to improve. BSC adheres to standards set by the AAAHC, Association for the Accreditation of Ambulatory Health Care. What is the "Brighton Difference"
Brighton is truly a "Freestanding Ambulatory Surgery Center". We have no ties to the hospitals, we don't have a hospital-style bureaucracy, we don't use a hospital-based anesthesia service, we are 100% physician owned and operated,* and we focus on the patient. We are committed to providing the Rochester community with the finest in surgical services. We didn't become the top surgery center in Rochester by accident; it's the result of the hard work of our employees and a focus on the patient that makes the difference. *Your referring physician may have a financial interest in the facility. Waiting room with free coffee, a wireless internet "hotspot", and satellite television. Please visit our CONTACT US page for a map and the ability to map your route.